* 8 new AI types, from the humorous/annoying “Kite Flier” and “Cowardly” to the monomaniacal “Starship Fanatic” to the aptly named “Brutal”. There’s also “Mime”. Never trust mimes. * A new “Encapsulated” map style (screenshot). * 2 new AI Guardian types, including the Combat Carrier Guardian (so humans don’t get to have all the ludicrous-drone fun). * A new “Preemption” optional AI Plot that lets the AI start taking more direct action against you from the start. 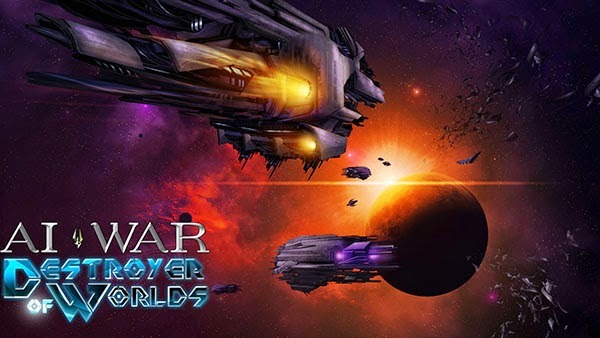 AI War: Destroyer of Worlds is slated for official release in August 2014, and we’ll be running a closed beta until then. If you’re interested in testing and providing feedback on the expansion during the closed beta, please send me (keith.lamothe) a PM on our forums. We’ll be contacting the first wave of testers that have already signed up later this afternoon. In other news, we’ve also added Steam Trading Cards for AI War. Enjoy! « AI War Beta 7.036-7.040 “Sanding Before The Storm” Released!